Poor Oscar Wilde. He wrote some very clever plays, stories, lots of poetry and one novel but died very poor tragically young. Among his writings was a short collection of fairy tales in which the main characters---as someone commented---lived "unhappily ever after". I guess that could have been said of Oscar as well. The best-known of these tales are The Happy Prince and, my favourite, The Selfish Giant. Resist it as I try, this one always leaves me dewy-eyed at the end. Oscar Wilde is buried at Pere Lachaise Cemetery in Paris, apparently the most-visited cemetery in the world. Years ago when I was a university student in Paris I spent many pleasurable hours wandering the streets of this huge cemetery discovering the tombs of famous artists, statesmen, scientists, military leaders, nobility and just plain rich people. Because so many of the tombs are above ground it's like being in a city of the dead---creepy but beautiful and filled with wonderful sculpture. Another attraction back then is that it didn't cost anything to get in. Well, not if you were alive. And it's still free today. Recently I was in Paris again and visited some of my old (excuse me) haunts in Pere Lachaise. One of those is Oscar's tomb. This great stone monument with an angel on it (I think it's an angel) is the work of the sculptor, Jacob Epstein. Sadly, since my first visits, the tomb has been loved to death. At first it was lipstick kisses and then other graffiti followed. Now it's covered in messages from admirers. Maybe Oscar would approve but I believe the City of Paris is about to clean it up and restore it to the original. I'm not sure how they intend to keep it from being graffitied again. Frederic Chopin's fans are much more respectful of his memory. No lipstick kisses here, just fresh flowers. Even past rocker Jim Morrison is shown more respect from devotees of The Doors. Who is this? Possibly a writer because he's holding a book. It shouldn't be long before he's joined by a writer holding an e-reader. Sleeping on a bed that's too small for you can be fatal. This monument "To Death" is one of the most haunting in the cemetery. Upstairs are a couple heading for the underworld and staring into the void ahead. Behind them are people soon to follow and none too happy about it. I'm not sure what's going on downstairs but the one lying on the ground doesn't look well. So put Pere Lachaise on your list of places to visit if ever you're in Paris. By the way, if you noticed a "Selby" graffito on Oscar's tomb, neither Selby nor his millions of fans around the world put it there---I did. Well, I didn't actually write it on Oscar Wilde's tomb but I couldn't resist adding it electronically to the photo. I guess this makes me a would-be graffitologisto. Five women and one strange-looking child sat silently at lunch. None was moving except Sheila Myers, ceramic artist and the creator of these arresting figures. She dashed around making last-minute adjustments to her "friends" before the opening of the her joint show that evening with fellow ceramicist, Barbara Mason. Sheila explained that the women were modelled on friends and herself. That's her seated in front of her real self and pouring from a blue bottle. The place was the Inner City Clayworkers Gallery, a ceramic artists' cooperative. My wife and I often stop in especially to see the annual teapot exhibition. (It's amazing what some people use to make their tea.) We'd never met Sheila and were surprised to learn that three ceramic cicadas we'd bought from the gallery were also her creations. Impressive as the women at lunch were it was the lunch itself---all ceramic---that got is in. It was so realistic that we could smell it. Bread, cheese, noodles, and some very realistic lettuce leaves. It wasn't long before we hurried home to a somewhat less crunchy lunch and tea straight from the teabag. 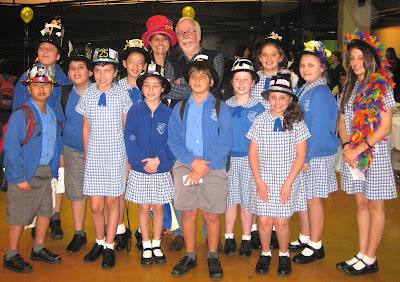 This year the Kids Own Australian Literature Awards (KOALA) had its twenty-fifth birthday at the Casula Powerhouse Arts Centre in the western suburbs of Sydney. But it was not just a birthday party but the annual awarding of the New South Wales' children's choice awards. It's the first time KOALA had its awards day at the venue but, hopefully, not the last. There's a big stage and seating for over 300 kids. 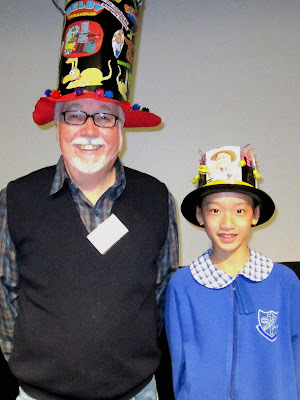 As usual the KOALA Committee did all the work and we authors and illustrators swanned in, were made a fuss of and had a good time. Full marks to the KOALA people, especially Val Noake and Antonina Fieni (both of them past presidents of KOALA) as well as the present president, Kris Fegent for all their hard work. 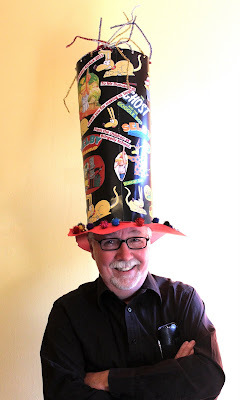 The schools attending made outlandish hats this year for the authors and illustrators. My own (the best of the lot) was made by the marvellous milliners and mad hatters of Bringelly Public School. The Queen would be jealous. 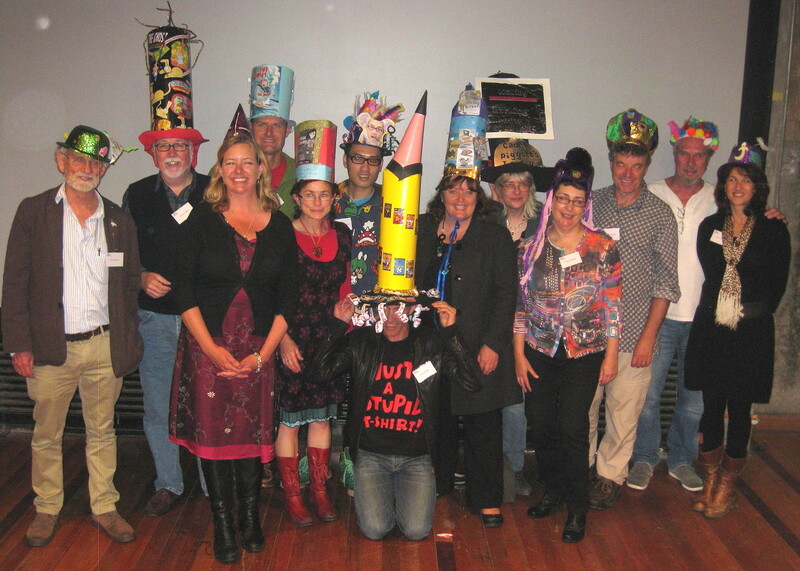 In the spotlight were (from L to R): Bob Graham, me, Belinda Murrell, Pat Flynn, Deborah Abela, Oliver Phommavanh, Andy Griffiths, Lisa Shanahan, Catherine Jinks, Robyn Bavati, Richard Tulloch, Kim Gamble & Anna Fienberg. To see who won the prizes have a look at KOALA 2011 AWARDS. Here with me is the immediate past president of KOALA and teacher librarian extraordinaire, Antonina Fieni, and her band of admirers. We all had our own personal assistants for the day. Mine was the very companionable Katelinh. Many thanks, Katelinh, for your excellent guidance!